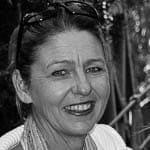 As Mina Herta sat on the wooden floor of her humble weathered eighty-year-old home, she flexed her big toe and masterfully plaited three strands of rattan. This would soon become a handle for the rice basket she was making. Between the strands of a woven basket, there is a skill passed through the generations. Basket weaving is a craft as old as time itself. Herta does her most of her weaving during the daylight hours and at night too, accompanied by dim lights from the tiny light bulb that hangs from the living room ceiling. I asked her if she had difficulty seeing and she replied, “I have to admit that it’s hard to see with these old pair of eyes. But my fingers know what to do and where to go”. A true testament to her long years of experience in weaving. 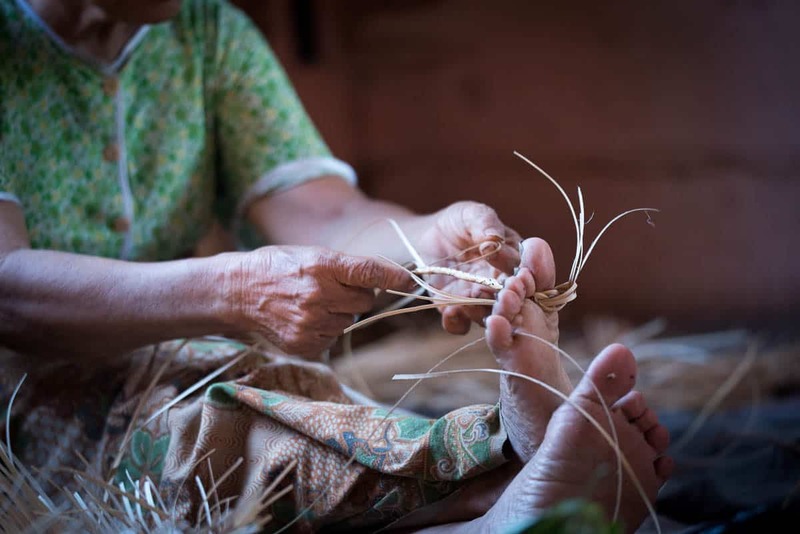 Herta invited me to join, so I lined up my toe with hers and started to plait the strands of rattan. However, I was completely hopeless at it. I had the wrong tension and an inconsistent pull of the strands. A real wobbly looking basket handle was starting to form, in twice the time it took Herta to make her creation. We had a bit of a laugh together and by sitting side by side with this Ngaju Dayak elder, I allowed myself to fall into the rhythm of weaving. I was able to strike up a conversation, which flowed with her fluid pace, and I found out about the practice of basket weaving and daily life in the village. Rattan weaving in Bukit Rawi is done as a collective. There are three groups of Ngaju Dayak weavers who work together. It is mainly practiced by the elderly people. However, there are some younger apprentices who have an interest in rattan weaving and are learning this skill. Men also weave. They make fish traps, which are called mihing. This involves going into the forest and finding a specific tree, which is then stripped. Next, a special plant stem must be found, one containing a poison that will stun the fish. 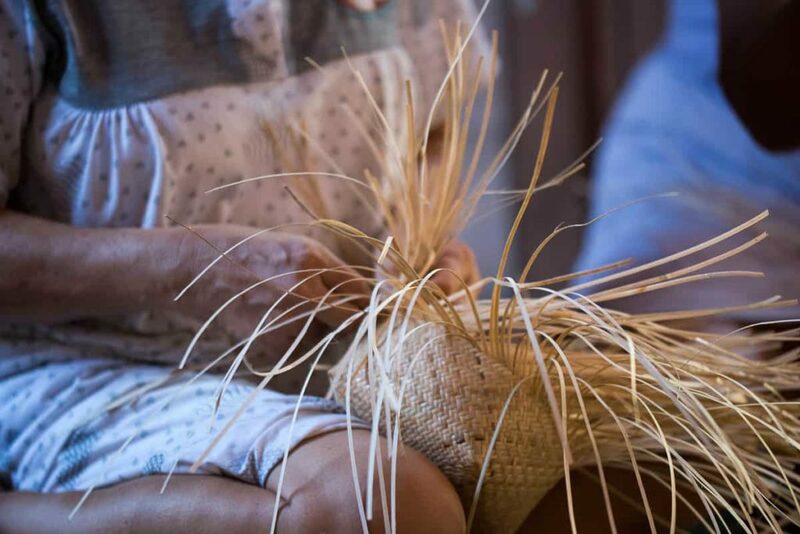 The men also weave pandanus leaves to make roofing—a never-ending job. Many types of baskets are made in the village including vegetable baskets, baby carrying baskets, rice baskets and backpacks (used as collecting baskets). These baskets are still in daily use today. The women sell their baskets at the local market and also in their village, but competition is tough. They must compete with factory made baskets, which are much cheaper. Factories use machinery to speed up the process of rattan cleaning, splitting and coring, and they sell the rattan products at a very low price. This is one of the few reasons why the rattan weaving culture in Central Kalimantan is diminishing in the villages. The young Dayak people are not very interested to continue the craft. They do not see this as a main source of income anymore. They prefer to work a temporary job at a palm oil plantation or local rubber plantation (whenever available) to obtain wages. The process of basket making starts with a trip to the forest. “Every day someone from the village is assigned to fetch the rattan,” Herta explained. It is no easy task and often involves going a long way up the river by dugout canoe to source the rattan. Next they must cut the stems and clean the thorns, and often the collectors end up with numerous cuts and wounds on their hands. “It is hard work collecting rattan,” Herta remarked. I was curious to ask about the dark blue strands that Herta was weaving into a pattern as we spoke, “Yes, this dark blue colour is made from a natural dye. We get this from special leaves we find in the forest, and we mix it with Rambutan leaves. We bury it in the mud for a few days and then make the dye. Other dyes come from special tree barks and leaves, but now it is getting hard to find these in the forest. The forest is shrinking you know. It’s very sad,” she said wistfully. Herta explained to me that teaching and passing on the intricate art of pattern making to young people involves time and patience. A novice needs to adhere to the authority of their elder teachers and must show commitment to the repetitive training processes. From one family to another, from one river to another, from the mountains to the sea, every village has a unique pattern and stylised weaving style. 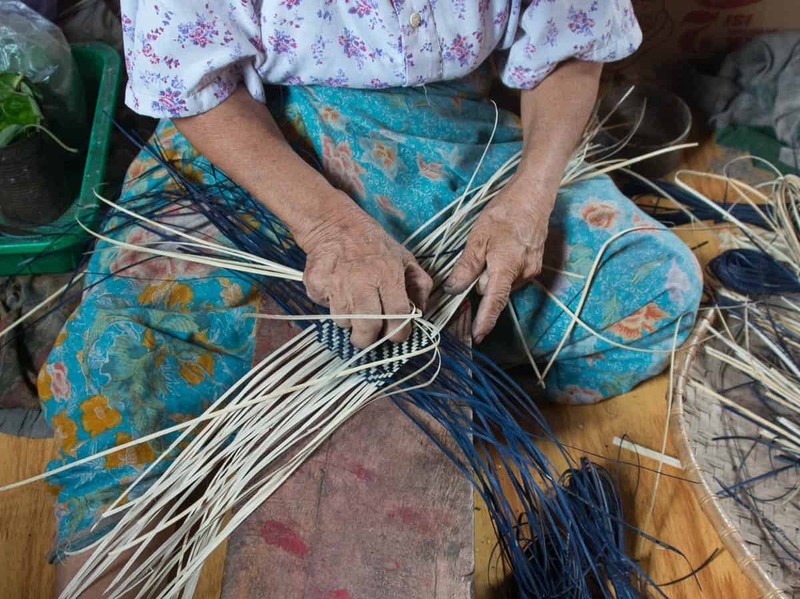 Weaving styles often describe the history of a clan, a family or a whole community. The patterns depict a range of woven heritage—from nature to the world of spirits. There is a lovely story woven into a pattern depicting the Tree of Life, known as batang garing. This tells the story of how two greedy hornbills were fighting over wealth and power, so much so that they killed each other. The higher power governing the world at the time punished the great birds and turned their dripping blood from its source in heaven into human beings. These human beings then had to live their lives on earth, full of mysteries which require solving, and so it is for us now on earth. For the Dayak people and tribal people of other origins strung across the Indonesian archipelago, weaving is a living heritage. To sustain this tradition, preservation of the forests for future generations is crucial. We need the great forests so our precious tree of life can continue for many more generations. Basketry holds a significant cultural role in many cultures. Weaving traditions from the Pacific particularly in Polynesia stretch from New Zealand to the Eastern Islands of the South Pacific and Hawaii. Similarities exist between these cultures due to a lengthy history of contact and exchanges between islands. Weaving baskets, mats and roofing in these neighbouring tropical islands is a shared heritage. In Kalimantan, as in the South Pacific, baskets are made of rattan, where available. Pandanus fibers are also used and the young midrib part of coconut leaves. Mostly the art is dying out because it is difficult to obtain the raw material plus the economy of scale required to make each product. Each type of Dayak basket is made to serve one specific purpose. Ragak sedang is used only for washing vegetables, cupai for collecting plants, tabung is used as a storage baskets, bubu fish traps support fishing and the round tanggui is the Dayak sun hat. Everything has its use. 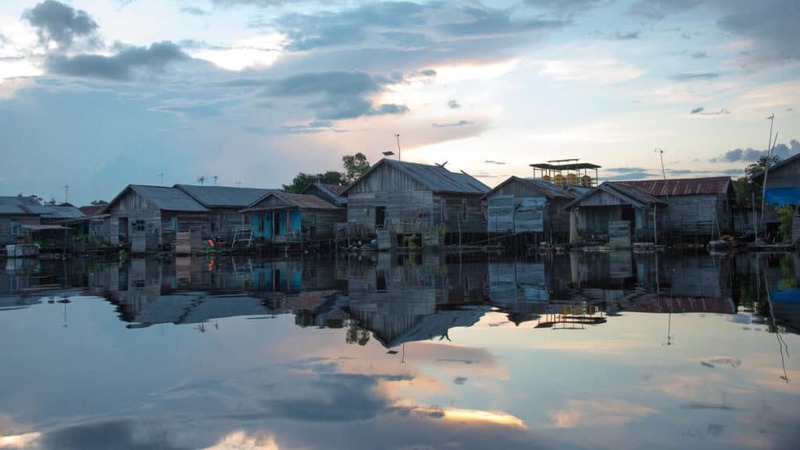 The Ot Danum tribe, located on the upper stretches of one of the largest rivers crossing Western and Central Kalimantan, are closely related to the Ngaju people. In their storytelling they believe the cosmos consists of a central level inhabited by humans and is layered between an upper world and a lower world. The upper world is composed of high mountains and is presided over by a deity conceptualized as the hornbill bird. In contrast, the lower world is the realm of water-based creatures, the chief of which is the dragon-snake. The Ot Danum weave this story of traditional cosmology on rattan mats and also depict the story on bamboo tubes by way of etching. The woven sun-huts depict creatures of the lower and upper worlds. These are separated by other motifs such as bands of leaves and rhomboidal shapes. Other common basket motifs include the lalak snake and its eggs and the matapunäi (the eyes of the punai dove). 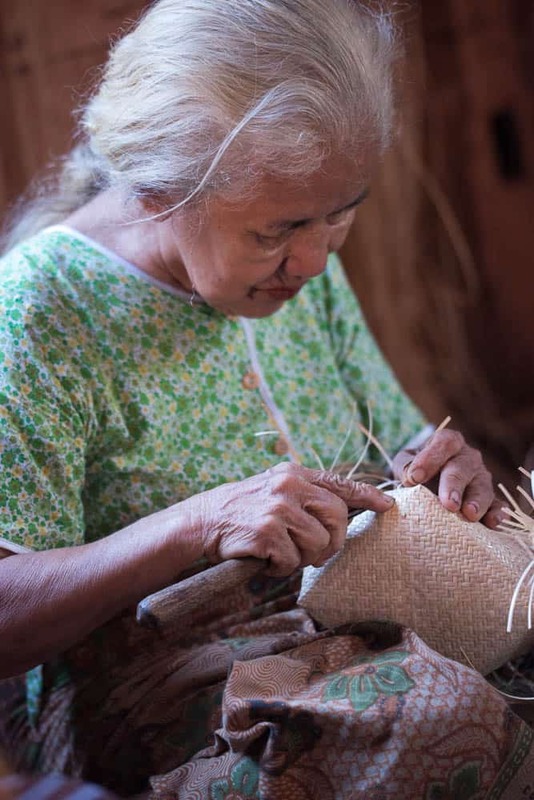 To help villages reach markets outside their home areas, fair trade shops buy the products, and one of these shops is Threads of Life, in Ubud, Bali. Sadly, the co-operative they were supporting and buying from recently sold out to the palm oil business. Needless to say, their rattan source is now gone. Threads of Life support sustainable products and preservation of forests and cultures of Indonesia. They sell many woven products via their online shop. Want to see rattan weaving in action in Bukit Rawi village? Watch it here. Photos are by David Metcalf – a masterclass photographer and co-author of Indonesia’s Hidden Heritage, Cultural Journeys of Discovery. David operates Taksu Photo Gallery, in Ubud, Bali.